Indicated for mild to severe ligament instabilities including the anterior cruciate ligament (ACL), posterior cruciate ligament (PCL), medial cruciate ligament (MCL) and lateral cruciate ligament (LCL). Also, used for post surgical knee rehabilitation, Osteoarthritis, Rheumatoid Arthritis, and more. The Rapid Knee utilizes double upright adjustable ROM hinges that provide adjustable flexion and extension joint control with rigid thigh and calf supports. The Rapid Knee is an open wrap on knee brace with additional compression straps for a tensioned fit. The wrap is snug and has a flat knitting to provide even compression and optimal knee stability. The solid metal frame provides secure support and reinforced comfort for the user. The open wrap configuration allows for post surgical convenience and optimization of fit. 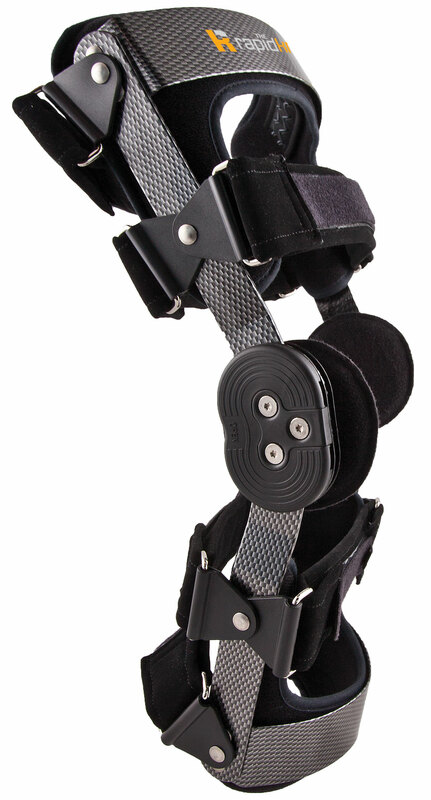 The Rapid Knee offers medial-lateral and rotation control, and a locking joint for positioning the knee. This joint can lock the knee into either a flexion or extension position. The adjustable flexion and extension joint enables the practitioner to set limits on flexion and extension but allows the patient to move the knee freely within those limits. The Rapid Knee is designed for a patient who can load weight on the knee and is capable of some ambulation. The Rapid Knee is operated by first sizing the patient to the appropriate brace, based on knee circumference (see below sizing chart). While in a sitting position, the Rapid Knee can be unwrapped (outer straps and inner straps opened), and slipped on the leg and knee, with the hard plastic thigh and calf braces facing forward and centered in the front knee area squarely. Velcro close the front ends and rear end straps to form a comfortable compression. Double check fit once more to ensure proper tension. Next, the adjustable hinge can be adjusted open for complete range of motion, or adjusted based on degrees of flexion/extension. Or optionally, stop it at some point to counter act contractures. The adjustable hinge is protected by a cover so as to not interfere with the other knee, and/or cause an adjustment pin to slip out of position. For mild to severe ligament instabilities including the anterior cruciate ligament (ACL), posterior cruciate ligament (PCL), medial cruciate ligament (MCL) and lateral cruciate ligament (LCL).